Taking classes at both campuses? Your commute is about to get easier. After much anticipation, SkyTrain’s Evergreen Extension will open Dec. 2 at noon. That means you’ll be able to travel between the New Westminster and Coquitlam campuses in less than 30 minutes, getting on at New Westminster Station and off at the new Lafarge Lake-Douglas stop. Need to get to the Coquitlam Campus from Lougheed Town Centre or Waterfront Station? Get there in about 16 minutes and 50 minutes, respectively. 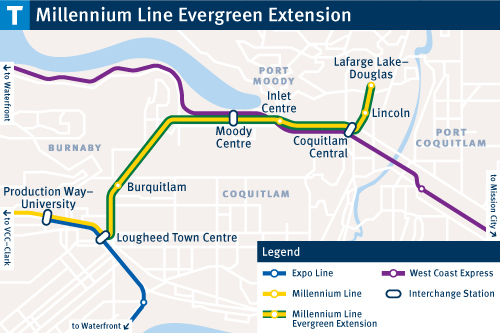 Steps away from the Coquitlam Campus, the Douglas-Lafarge Lake Station will connect to Lougheed Town Centre without transfer to the current Millennium Line. And for students travelling into the Tri-Cities from the east – including Mission and Pitt Meadows – the Evergreen Extension also integrates with the regional bus and West Coast Express networks via Coquitlam Centre Station. In total, there will be six new stops, including Lafarge Lake–Douglas, Lincoln, Coquitlam Central, Inlet Centre, Moody Centre, and Burquitlam. Don’t forget – you’ll need to load your U-Pass onto your Compass Card to ride SkyTrain. Check out these step-by-step instructions on how to do that. For more information, visit TransLink online or check out this video.